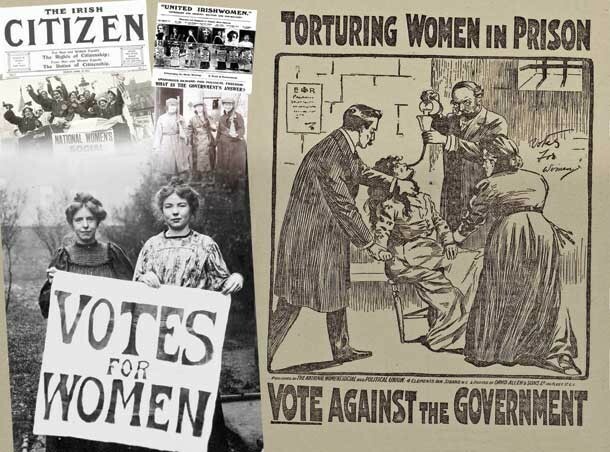 At the start of the 20th century women began to campaign actively against the denial of their right to vote. In 1903 the Women’s Social and Political Union was founded in England and the militant feminists commenced the battle for the vote. In Ireland there had been groups working for women’s suffrage but the campaign really began here on the instigation of Hanna Sheehy Skeffington and Margaret Cousins. Margaret Cousins came from a unionist family in Dublin but she later wrote: “I belonged in my heart from the beginning to the fighters for freedom.” Her husband James Cousins also rejected the unionism of his background and became involved in the Gaelic revival. Margaret came into contact with the women’s movement in England in 1906. On her return to Ireland she co-operated with a remarkable young woman who was to make her mark on Irish history. Hanna Sheehy was the daughter of a Fenian, David Sheehy, who took part in the 1867 Rising and was elected as a Parnellite MP in 1886. Hanna was an exceptional student and excelled academically; despite the restrictions on women’s access to education she achieved a first class honours MA in 1902. She became a teacher and married Francis Skeffington. In line with their shared feminist principles they adopted each other’s surnames. Francis resigned his post as registrar of University College because the authorities refused to register women on the same basis as men. The IWFL campaigned throughout the country and made an impact beyond their numbers of about 50 activists. Not all militant women agreed with the IWFL’s tactics; the republican group Inghinidhe na hÉireann refused to join in lobbying the British parliament, preferring to “organise a women’s movement on Sinn Féin lines, or on lines even broader still”. Markievicz said Irishwomen were “doubly enslaved with a double battle to fight”. Following the 1910 general election the Irish Party at Westminster was in a position to press the Liberal government to publish a Home Rule Bill. But Redmond and his party still refused to support women’s right to vote. The IWFL became more militant and Hanna and Francis founded the Irish Citizen newspaper to further the cause of women’s rights as well as Irish independence, social justice and pacifism. When British politicians visited Ireland they were challenged by the IWFL. 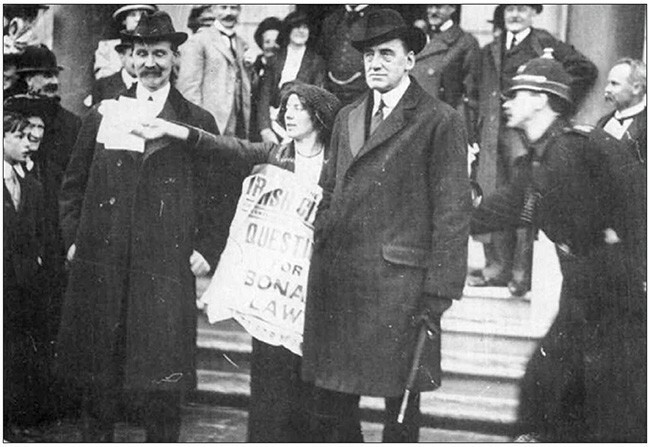 Margaret ‘Meg’ Connery confronted British Tory leader Andrew Bonar Law and Unionist leader Edward Carson when they came to Dublin. In Belfast Hanna Sheehy Skeffington challenged Winston Churchill. Margaret Cousins joined protests in England in 1910 and was jailed for a month. In June 1912 eight women from the IWFL smashed windows in Dublin Castle and other prominent buildings. Hanna was arrested at the Castle and she and the seven others were imprisoned in Mountjoy. The following month British Prime Minister Asquith visited Dublin and there were more protests. 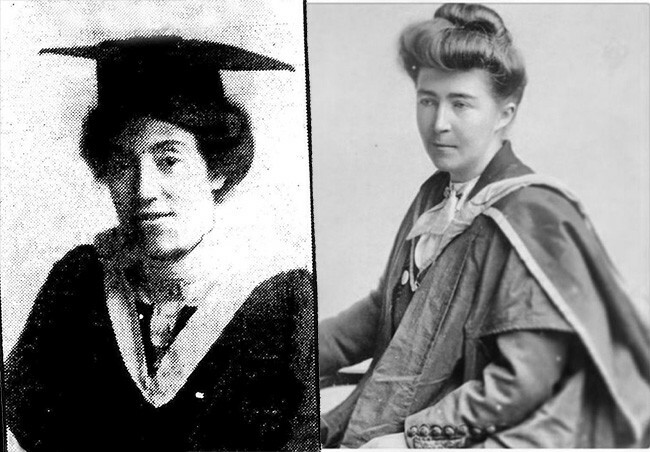 Three English feminists had followed Asquith to Ireland and they were also jailed for their protests. After a hunger strike in Mountjoy by the English suffragists and the IWFL women, all were released except two of the Englishwomen who were subjected to forced feeding. 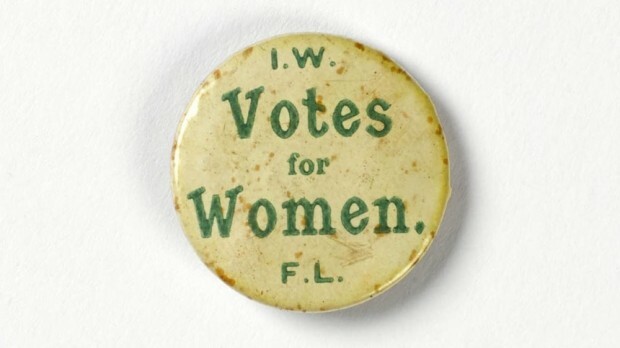 Many meetings of the IWFL were physically attacked at this time by Redmondites who saw the campaign for women’s suffrage as a threat to their political dominance and their relationship with the British Liberal government. In contrast, republicans such as Pádraig Mac Piarais and Thomas MacDonagh were supporters of the IWFL. The IWFL also won the support of prominent trade unionists James Larkin and James Connolly. They were closely allied with the Irish Women Workers Union in Liberty Hall and in 1913 Hanna Sheehy Skeffington was jailed after a confrontation with the Dublin Metropolitan Police during the Great Lockout. She was released after a six-day hunger strike. That year also saw the death in England of feminist Emily Davison who ran on to the course at the Epsom Derby and was trampled by a race horse. Hanna Sheehy Skeffington was jailed again in 1914 for campaigning against recruitment to the British Army. Her influence and that of the IWFL was seen in the Proclamation of the Irish Republic of 1916 which enshrined women’s right to vote. Her friend James Connolly told her: “You will be glad to know that in the Proclamation of the Irish Republic we are including equal citizenship for women.” Hanna replied that she knew who was responsible, meaning Connolly himself. “We were practically unanimous, Only one questioned it,” replied Connolly. Francis Sheehy Skeffington was murdered in Portobello Barracks by a British Army officer during the Easter Rising. Hanna embarked on a tour of the United States to expose the truth about the murder and other British atrocities. She continued to play a leading role in the struggle for Irish freedom, as did many of the pioneering feminists of the IWFL. 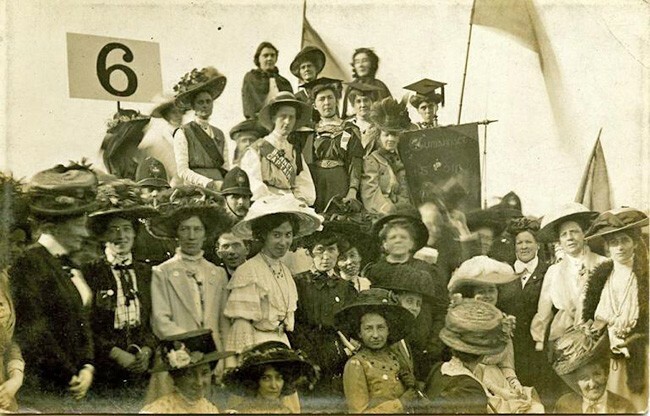 In 1918 the IWFL saw its central aim achieved when women voted for the first time in the general election which resulted in a massive Sinn Féin victory, although women under 30 were still excluded. The IWFL actively opposed British rule and supported Dáil Éireann. For example in August 1919 Hanna was badly beaten by the RIC who attacked a Sinn Féin meeting at which she spoke in Kilbeggan, Co. Westmeath. IWFL women went on to champion women’s rights in the decades following the Treaty when they faced the very different challenges of a partitioned Ireland with conservative anti-women governments North and South. The Irish Women’s Franchise League was founded 110 years ago on 11 November 1908.